Hotspot Shield is one of the best VPN software you can install on your PC and Mac. While the Hotspot Shield itself works excellently on PC and Mac, at times, you may end up with Something Went Wrong Error while using it. Here is how to fix hotspot shield something went wrong error in Windows 10, 8.1,7 and Mac running MacOS Sierra, Yosemite, etc. The Hotspot Shield something went wrong error suddenly started showing when I restarted my PC. When I tried to run Hotspot Shield, it was only showing “Something Went Wrong, we are trying to fix the problem. It might take few seconds”. Fortunately, after tinkering for few minutes here and there, finally, I resolved the error and fixed hotspot shield something went wrong error. If you are facing similar kind of error with hotspot shield here is what you can do to fix it. Even though Hotspot Shield is available for Smartphones as well, all of the below-mentioned fixes won’t work on them. As some fixes require you to access hotspot shield files that are only visible on PC and cannot be accessed using smartphones. These fixes are for Hotspot Shield running on Mac and Windows PCs and Laptops. Though this is no fix, it can work at times. A Quick restart solves some of the annoying problems in PC. 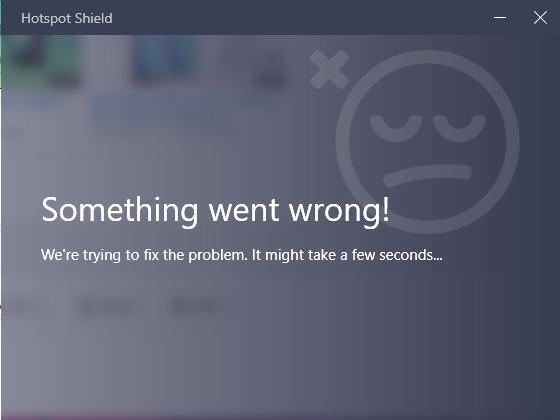 Something went wrong error may occur because the hotspot shield could not start properly and a restart might fix it. Hotspot Shield Fix Me is an inbuilt application included in the installation file of the Hotspot Shield software. What it does is whenever a user faces a problem with Hotspot Shield, it runs itself to fix common problems. If you have seen the error, it says, “Something went wrong, we are trying to fix it. It might take a dew seconds”. The software will run fix” me” application to fix the problem. However, for an unknown reason, the Hotspot shield was unable to run the fix me program. When I tried to run it manually, it finally fixed the something went wrong error. So, here is how to do it. Close Hotspot Shield completely. 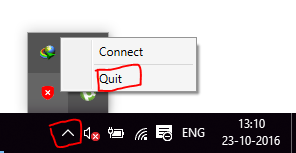 Click on the Up-arrow icon in the taskbar, right-click on Hotspot Shield and select Quit. From your desktop screen, right-click on Hotspot shield icon. Next, select open File Location. It will open the path location to C:\Program Files (x86)\Hotspot Shield\bin. Here you have to search for the hssfixme.exe file. Once you have found the file, double-click on hssfixme.exe to run it. Note: If you don’t see hssfixme.exe file then click on View (at the top left) and check the option “Hidden Items” in show hide section. Wait till the hssfixme.exe starts and fixes the problem. Once the problem is fixed, Hotspot Shield will start automatically. There you have it. Now connect the hotspot shield to the internet and surf anonymously. If nothing seems working, you can try reinstalling the Hotspot Shield. The problem could be with your hotspot shield software itself, and a reinstallation might just fix it. Go to Control Panel >> Program >> Programs and Feature. Select, Hotspot Shield, and select Uninstall. Now reinstall Hotspot Shield, and see if the something went wrong error is fixed. It was practical for me and my HOTSPOT started working. Solution 2: PERFECT. I usually just restart but that isn’t practical sometimes. Thank you very much. I did not find the file hssfixme.exe …help! Hi, vietha, if you did not find hsssfixme.exe, then click on View ( look in the top left) and then make sure that “Hidden Items” option is selected. Thanks. That didn’t take long! Sweet! Fix 2 fixed it. Thanks a lot! man you are the best. works for me hssfixme. thanks alot. Hi.It didn’t work with your first 2 solutions.Only it fixed with reinstalling.This error comes again after I end task it in task manager and I have to reinstall it again to make it work again.Is there any other solutions you can give to fix this repetitious problem? I cant find the fixme file and have checked the hidden option in view. is there another work around or can you upload a copy of the file at all? Hi terry, seems like the new version of Hotspot Shield does not have this option. Will update the post when I find more info. In my case the problem was that the HotspotShield service had stopped and was not being started automatically. I started the service manually and HSS started to work ok.
Omg thanks bro i think thats the best solution! I’m deleting this thing. Was good for a while, but now I keep getting this error message and the only way to fix it is reinstall it, I’m trying a different vpn. Hi Brett, Try TunnelBear or OpenVPN if you need a free VPN. Thanks for the tip Reza, hope that helps others! 3.i restarted it at windows services . didnt work too ! i really liked hotspot plz help me fix it . My service name is Hotspotshield Service and restarting it worked perfectly. FANTASTIC…two or three clicks and I resolved my problem. Thank you!!!!! How to do that Reza? there is no “hssfixme” in newer vesions, and i cannt download it again, is there an other way ?